The success of eccentric exercise for the treatment of tendinopathy is an excellent example of mechanotransduction at work. The tendon fibroblast (tenocyte) is the predominant cell found in tendon and is responsible for producing the components of the ECM and maintaining tissue homeostasis. Tendon is relatively avascular and therefore relies largely on autocrine and paracrine responses for tissue remodeling, repair, and adaptation. In addition to tenocytes, progenitor cells exist in tendon, and they are extremely mechanosensitive. Inappropriate mechanical load pushes these progenitors toward alternate phenotypes (chondrocytes, adipocytes, osteocytes), which results in the pathologic changes characteristic of tendinosis. Tendinosis is a common histologic finding in overuse tendon injuries that is characterized by noninflammatory degenerative changes of the ECM and aberrant cellular responses. Tendon attaches muscle to bone, transmitting forces to the skeleton and resulting in joint stabilization and movement. As a result, tendons are subjected to high mechanical loads that predispose them to injury. Tendon’s reaction to overuse injury has been described as a failed healing response (Maffulli, Sharma, and Luscombe 2004) due to the ineffective and insufficient inflammatory response generated after injury. Tendon pathology may be classified as either tendonitis: inflammation, pain, and swelling of the peritenon; tendinosis: degeneration of the ECM and absence of inflammation upon histologic examination; or tendinopathy. Tendinopathy is the contemporary clinical term for tendon overuse injuries, as it does not imply an active inflammatory process, which is often the case. While the etiologic factors of tendinopathy are not fully understood, a failure in the mechanobiologic response of the tenocyte has been implicated. Tendon structure, composition, and mechanical properties are modified in response to altered mechanical loading conditions. Disruption in the mechanobiologic response of the tenocyte creates a vicious cycle of suboptimal ECM production, in turn leading to further changes in mechanical signals transmitted to the tenocyte and propagating degenerative tissue production throughout the tendon (figure 16.8). Many hypothesize that mechanical overload initiates a degenerative signaling cascade that leads to tendinopathy, while some believe tendinopathy is a result of focal disruption of ECM and accompanying mechanobiologic understimulation of locally adherent tenocytes and progenitor cells. Pathologic changes in tendinopathy. (a) Collagen organization: H&E. (b) Increased proteoglycan. Reprinted, by permission, from M. Joseph et al., 2009, "Histological and molecular analysis of the biceps tendon long head post-tenotomy," The Journal of Orthopedic Research 27:1379-1385. Signaling cascades leading to tendinosis probably result from understimulation of FACs and downstream MAPK-mediated events. The activation of stress-activated protein kinase (SAPK), a member of the MAPK family, is associated with matrix-degrading enzyme production. As mentioned, load affects progenitor cell survival and differentiation. Tendon progenitor cells exposed to 4% strain assume tenocyte function and express collagen type I. However, loads of 8% resulted in the expression of markers for bone, fat, and cartilage differentiation. The presence of these cells and their functional products is destructive to tendon ECM and health (Wang et al. 2007). An alternative paradigm for the pathophysiology of tendinopathy is emerging and involves tenocyte-produced neuropeptides. Chemical messengers thought to be confined to neurons are produced in abundance in tendinopathic tissue. Substance P and its receptor (neurokinin-1 receptor [NK-1 R]), glutamate (Scott, Alfredson, and Forsgren 2008), acetylcholine (ACTH), and catecholamines are produced by local tendon fibroblasts. Tenocytes produce these neurochemicals in response to mechanical load. Substance P increases cellular proliferation in culture, which corresponds with observations of hypercellularity in early tendinosis. Pain in tendinopathic tissue has been traced to neurovascular ingrowth containing substance P positive nerve fibers, and the ablation of these fibers often results in relief. The NK-1 R is a G-protein coupled receptor that is responsive to mechanical signals. There is likely cross talk between integrin-linked kinase production resulting from integrin stimulation and cross-activation of the G-protein via ILK activation (see figure 16.5). Substance P signals through the MAPK cascade and results in gene expression. Tendon cell networks communicate throughout the tissue via cytoplasmic extensions and cell junction zones. A signal that is sent in one area propagates through these channels, effecting a tissue-wide response. Intercellular connectivity is achieved through gap junctions, where connexins are the principal protein. In healthy tendon, tenocytes are arranged longitudinally between collagen fibers. Connexins 32 and 34 form communications between longitudinally arranged tenocytes, whereas connexin 43 links cells in all directions (Ragsdale, Phelps, and Luby-Phelps 1997). Articular cartilage is the major load-bearing tissue in synovial joints. Cartilage is unique in that it is avascular, aneural, alymphatic, and sparsely populated with cells. The cartilage cell (chondrocyte) is responsible for the remodeling of cartilage ECM, and it does so in response to mechanical force. 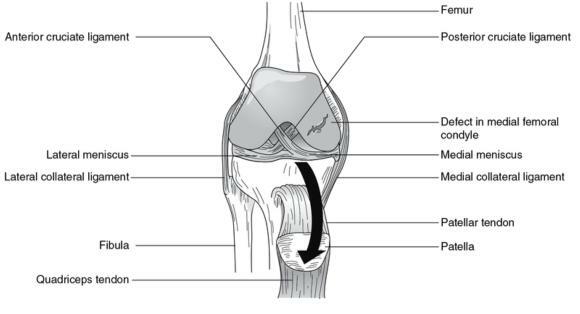 Cartilage in relatively unloaded areas such as the medial patellar facet is softer and less resilient. Articular cartilage responds favorably to pulsatile doses of load, while static loading results in up-regulation of a host of inflammatory cytokines, matrix-degrading enzymes, and degeneration. Chondrocytes are extremely responsive to compressive loads, as their location and function would indicate. A pericellular matrix composed of collagen VI and proteoglycan surrounds the chondrocyte and is an independent unit of force transduction. 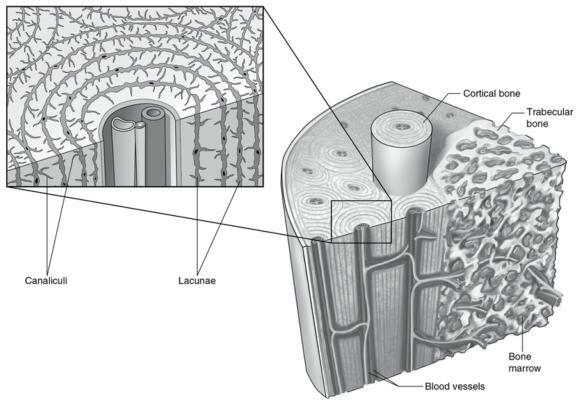 The pericellular matrix is analogous to the basal lamina in skeletal muscle, bridging the gap between cell membrane and ECM. Membrane stretch - activated ion channels exist, are proximate to integrins, and likely have overlapping downstream signaling cascades. Stimulation of the integrin Î±5Î²1 pathway results in the production of aggrecan, the predominant proteoglycan in cartilage, along with the down-regulation of MMP3, the predominant degrading enzyme of PG. Higher levels of aggrecan and collagen II production are associated with dynamic compressive force, whereas static forces result in MMP production and ECM destruction. Chondrocytes from arthritic cartilage are unresponsive to mechanical stimulation, indicating cellular dysfunction and mechanoinsensitivity in osteoarthritis (Raizman 2010). Inappropriate mechanical loading is the primary risk factor for the development of osteoarthritis (OA) (figure 16.9). OA is characterized by a loss of tissue homeostasis and the prevalence of catabolism. Molecular components of mechanotransduction in chondrocytes consist of integrin activation and downstream MAPK signaling, as well as stress-activated calcium channel signaling. The Î±5Î²1 integrin binds pericellular matrix fibronectin and associates with calcium channels in the surrounding cell membrane. In response to mechanical stimuli, integrin and calcium signaling pathways converge on MAPK cascade, where Ca2+ regulation of integrin activity through Src occurs (Raizman et al. 2010). Damaged articular cartilage. Large defect in the medial femoral condyle. The Cbp/p300-interacting transactivator 2 (CITED2) is a transcription regulator that is thought to balance catabolic and anticatabolic cascades and is thus centrally implicated in the pathogenesis of OA (Leong et al. 2011). CITED2 binds with and modulates a host of transcription factors. The ability to activate anabolic pathways and to inhibit inflammatory and catabolic pathways in response to mechanical signals suggests a central role in mechanical regulation. CITED2 is downstream of MAPK. Moderate-intensity intermittent loads activate CITED2, whereas high-intensity loads do not (Leong et al. 2011). Increased CITED2 expression correlates with the production of collagen II, maintenance of ECM, and suppression of MMPs. Integrin and associated receptors, downstream MAPK, and CITED2 represent a loading-specific pathway that has direct effects on tissue. Thus, loading of cartilage is essential to tissue health while overload leads to degeneration and OA. Exercise can play an important role in the treatment of OA, but excessive loading may accelerate the disease process. In summary, the chondrocyte is dependent upon mechanical signals for survival. The aneural, avascular nature of articular cartilage accounts for its susceptibility to damage. Enhanced maintenance and repair of articular cartilage is possible through mechanobiologic manipulation. Chondrocyte preference for dynamic, pulsatile delivery of force will continue to be explored both in exercise prescription and modality delivery. Metabolic demands on the skeleton are managed largely through calciotropic hormones, but the ability of the skeleton to adapt to its loading environment is essential for bone health. Wolff’s law first proposed skeletal change in response to functional demands. We now understand that it is the cells of the skeleton - the osteoblasts, osteocytes, and osteoclasts - that remodel bone in response to stress. An example of bone’s sensitivity to mechanical demand is demonstrated in cortical bone of the dominant arm in elite tennis players, which can be up to 35% thicker than the cortical bone of the non-dominant arm. Rapid bone loss during periods of immobility and in microgravity exemplifies the homeostatic necessity of mechanotransduction. Bone is certainly not as deformable as connective tissue, at least elastically. Bone can experience up to 0.3% strain, much less than ligament or tendon (5% - 20%). Bone experiences a wide variety of mechanical stimuli that produce slight deformation in the bone tissue, pressure in the intramedullary cavity and within the cortices, transient pressure waves, and fluid shear forces through the canaliculi. Osteoblasts at the surface of bone respond to deformation of the cell membrane from strain experienced on the surface of the bone from imposed forces. Osteocytes located deeper in the bone tissue respond to shear stress of fluid flow through the canaliculi (figure 16.10). An externally applied load forces fluid out of regions of high compressive strains. This fluid returns when the load is removed. This results in bone cell exposure to an oscillating fluid flow. The osteocyte population, through its interconnectedness via gap junctions, comprises a three-dimensional sensing systemin which amplification of mechanical signals propagates throughout the tissue. Structure and lacuna canalicular network of bone. As in tendon, integrins are important conductors of mechanical signals in bone cells (Salter, Robb, and Wright 1997). In bone, the Î² subunit of the integrin extracellular domain mediates binding to matrix components. Prominent matrix ligands for integrin in bone include collagen I and III and fibronectin. The formation of FAC in response to integrin activation is critical to cell adhesion, survival, and production. Mechanical signals activate the MAPK cascade, leading to down-regulation of RANK ligand (RANKL) expression and the formation of osteoclasts. Strain, shear, and pressure result in the mobilization of intracellular calcium. This rapid increase in intracellular calcium concentration appears to occur due to phospholipase-C activity and IP3 signaling, which results in the release of calcium from intracellular stores (calcium-mediated calcium release). Musculoskeletal cells are exposed to forces transmitted through tissue. Mechanotransduction pathways modulate diverse cellular functions. Physiologic effects result from intracellular signaling of membrane receptors and ion channels. The integrin receptor, bound to the tissue and stimulated by stress, can coactivate cytokine receptors and ion channels, resulting in a coordinated cell response. The musculoskeletal system provides a link to the physical environment. The encompassing nature of mechanical signaling likely represents the primary means by which adaptation to force exposure occurs. For clinicians this is exciting, as much of what we do involves modulating force through exercise and physical interventions. The obvious hurdle in fully accessing this tool is the difficulty of quantifying in vivo human forces, both those that result in injury and those produced by specific mechanical interventions. Future research and technology will be essential for identifying optimal mechanical interventions and their specific prescription. This chapter outlines the biology underpinning mechanical intervention. Harnessing the power of mechanotransduction is our most powerful tool for affecting musculoskeletal health and adaptation.